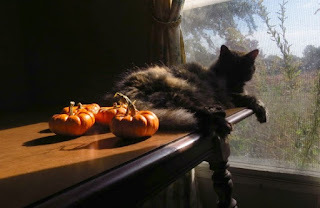 Missy is keeping those cute little pumpkins company. Sure is better than wearing some costume. Two wearing her pumpkin bandana. Well someone had to do it, I guess I was the chosen one to wear the witch hat. At least it wasn't on top of my head. A very happy Halloween to all. Happy Halloween sweeties! Y'all are so cute but you know I would wear that hat! Pawsome!!! !Hope you get lots of TREATS!!!! Gorgeous job, kitties! Happy Halloween! OMCs you are ready to par-tee!! I love that black hat!! Oh, you are all so adorably festive! You certainly just got us into the purrfect Halloween mood. 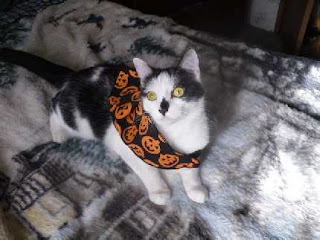 Purrs, and happy Halloween to all of you! Happy Halloween to Missy and Two. You all look very much in the mood for Halloween. We hope you get lots of treats! You are a good sport Two Two. Both costumes look great, and you are so patient. You look great ! Happy Halloween! Awww, and you are all so very cute. Great Halloween shots. Great Halloween photos! Have a safe and fun Halloween! 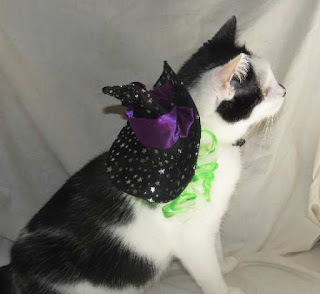 Very cute for your Halloween shots. Happy Pumpkin Day! That's a really cute hat! I would have to wear it on my head, though. That is how it works around here. Happy Halloween all of you. How is Split now? You all look great! Happy Halloween! Owen went to the vet this morning for his check up and shots and he is sort of out of it. Poor guy. So, he is sitting on the couch watching the kids coming to the door. No costumes here for humans or animals! Costumes or no costumes, you all look adorable!! We think you look wonderful in your costumes, pals. Have a happy (and safe) MEOW-loween! Happy Howl-ween to all of yous from all of us!!! Mes can't believes this is the last week of the Campaign!! !